When Queen Victoria signed this document on 9 July 1900 the Bill providing for the creation of the Commonwealth of Australia became law, enacting the Australian Constitution and the founding of the Commonwealth. The Commission of Assent, with the original Commonwealth of Australia Constitution Act and the Letters Patent establishing the office of Governor-General, are thus the 'birth certificates' of the Australian nation, the key instruments of the Commonwealth. The Australian Constitution Bill was drafted at a series of Constitutional Conventions in the 1890s and taken to London in 1900 by a delegation led by Edmund Barton. The Bill to establish the Commonwealth of Australia had to pass through the British Parliament and this was achieved after some struggle about allowing appeals from Australian courts to the Privy Council in Britain. 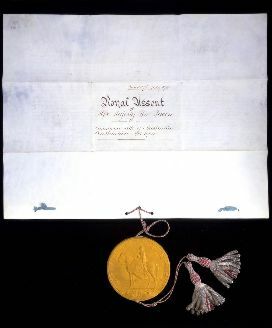 At the request of the jubilant Australian delegation, Queen Victoria signed her Royal Assent in duplicate so that a copy could be brought back to Australia. 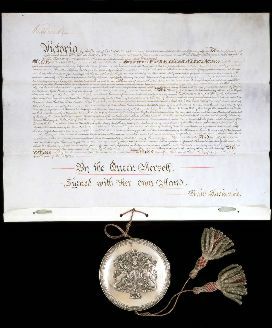 The Queen presented this document with the pen, inkstand and table used at the ceremony in Windsor Castle to Edmund Barton, spokesman for the delegates. The writing table, of brass and ebony, with gilded ormolu decoration and a surface of tan morocco leather, has been used for rare ceremonies since. It can be seen in photographs of the Commonwealth inauguration ceremony in Centennial Park, Sydney on 1 January 1901. Brooks, Herbert (ed. ), The Federal Story: The Inner History of the Federal Cause, 1880–1900 Alfred Deakin, Robertson & Mullens, Melbourne, 1944. Garran, R, Prosper the Commonwealth, Angus & Robertson, Sydney, 1958. Irving, Helen, To Constitute a Nation: A Cultural History of Australia's Constitution, Cambridge University Press, Melbourne, 1997. This is a single vellum sheet 51 x 66 cm with a beautiful pearly sheen. Attached by a crimson and silver bullion cord and tassels is a round silver case containing the wax seal with the Royal insignia. On the reverse, folds around the wording are clearly visible. Conservation treatment now enables the document to be kept unfolded. A facsimile of this document, made for the Australian Bicentennial Exhibition which toured Australia during 1988, is displayed in Parliament House Canberra. 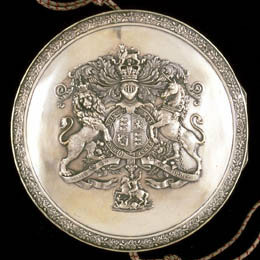 This silver case contains the wax seal with the Royal insignia. Provenance: Presented to Australia by Queen Victoria on 9 July 1900. Kept in the National Library of Australia (then known as the Commonwealth Library) before being moved to the first Parliament House. The National Archives was given custody of the document in 1988.